It is with deepest regret that DWO announces the passing of Classic Series Doctor Who Actress, Kate O'Mara. Kate was perhaps best known to Doctor Who fans for playing the role of The Rani in the Classic Series adventures; The Mark Of The Rani, & Time And The Rani. She also appeared as The Rani in the 1993 Children In Need charity special, Dimensions In Time. Kate's other career highlights include roles in; Z Cars, The Brothers, Dynasty, Howards' Way and Benidorm. DWO would like to extend our sympathies to Kate's family and friends. It is with deepest regret that DWO announces the passing of Classic Series Doctor Who Director, Derek Martinus. Derek was perhaps best known to Doctor Who fans for directing the Classic Series adventures; Galaxy 4, Mission To The Unknown, The Tenth Planet, The Evil Of The Daleks, The Ice Warriors & Spearhead From Space. He was also the first person to direct a colour episode of Doctor Who (Spearhead From Space). Fans of Doctor Who are set to find the TARDIS materialising at a new location this Easter as a selection of the Time Lord’s classic adventures in time and space start screening on Horror Channel. The UK’s prime home for fans of horror, fantasy and sci-fi has completed a deal with BBC Worldwide to broadcast 30 stories from the Classic series which ran 1963 to 1989 featuring the first seven Doctors, starting with William Hartnell and concluding with Sylvester McCoy. This specially curated season give fans old and new a chance to get re-acquainted with favourite companions Jamie, Jo Grant and Sarah Jane Smith, rogue Time Lords such as The Master, Omega and The Rani and all those iconic monsters including Daleks, Cybermen, Sea Devils and Ice Warriors. Launching on Friday 18th April (Good Friday) the season begins with the very first story ‘An Unearthly Child’, starring William Hartnell as The Doctor. It then leads into a special WHO ON HORROR weekend - a classic marathon featuring one story from each of the Doctors across the Easter weekend. There will then be weekday double-bills in daytime and evening slots with stories shown in chronological order starting on Easter Monday 21st April. Horror Channel is screening many of the stories that are regarded as the most memorable that the show produced including ‘The Mind Robber’, ‘The Daemons’, ‘Genesis of the Daleks’, ‘The Talons of Weng-Chiang’, ‘The Caves of Androzani’, ‘Attack of the Cybermen’ and ‘The Curse of Fenric’. Many emphasise the horror elements of the programme from the first scary moments the Daleks appeared, to encounters with giant spiders and maggots, and even battles with Mary Whitehouse over the violent content of the show during Tom Baker’s era. The twelve 25-minute episodes will be shown back to back at London's Prince Charles Cinema on Saturday 22nd February at 11:15am. Tickets will go on sale from 9:00am on 14th February 2014 from www.princecharlescinema.com, and are priced £14 (£11.50 Prince Charles Cinema members). + Download The Enemy Of The World for £9.99 via iTunes in the UK. + Download The Enemy Of The World for $9.99 via iTunes in the USA. 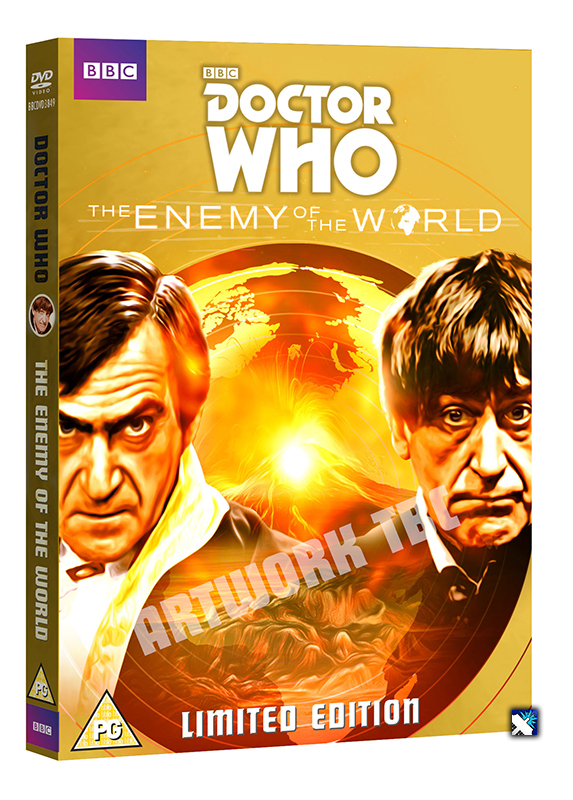 + Order The Enemy Of The World DVD on BBC Shop for just £13.99! + Download The Web Of Fear for £9.99 via iTunes in the UK. + Download The Web Of Fear for $9.99 via iTunes in the USA. + Order The Web Of Fear DVD on BBC Shop for just £13.99! It is with deepest regret that DWO announces the passing of Classic Series Doctor Who Director, Christopher Barry. Christopher was perhaps best known to Doctor Who fans for directing the Classic Series adventures; The Daleks, The Rescue, The Romans, The Savages, The Power of The Daleks, The Daemons, The Mutants, Robot, The Brain Of Morbius and The Creature From The Pit. He was one of only three people to direct stories featuring the first four Doctors (William Hartnell, Patrick Troughton, Jon Pertwee and Tom Baker). DWO would like to extend our sympathies to Christopher's family and friends. It is with deepest regret that DWO announces the passing of Classic Series Doctor Who Actor, Jerome Willis. Jerome was perhaps best known to Doctor Who fans for appearing in the Classic Series, 3rd Doctor adventure; The Green Death as Stevens. Jerome's other career highlights include; Within These Walls, Wish Me Luck and Space Precinct. DWO would like to extend our sympathies to Jerome's family and friends. Nine Missing Doctor Who Episodes Recovered! Nine previously missing episodes of Doctor Who from the 1960s, which have not been seen for over 45 years, have been discovered and will launch exclusively on iTunes Today. 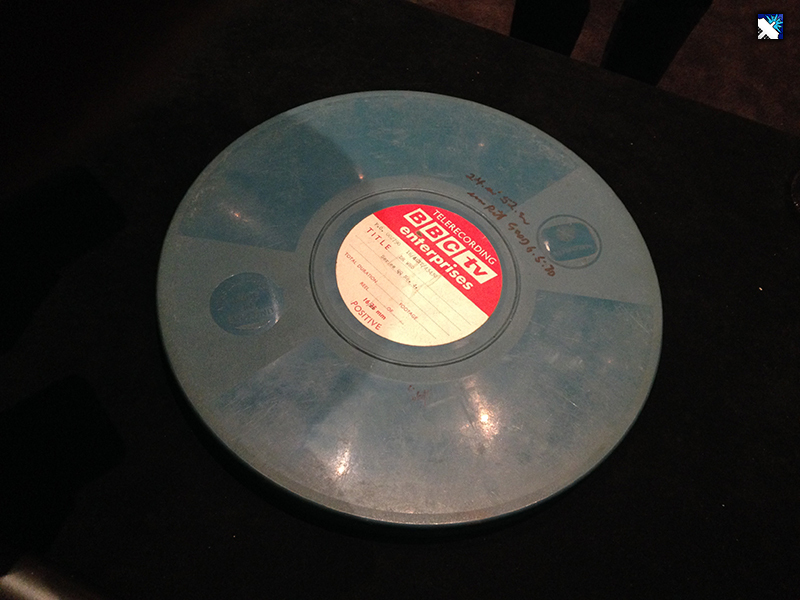 BBC Worldwide announced the find at a press event yesterday, which DWO attended, and we're delighted to announce that nine recordings from the 1960s featuring missing episodes of Doctor Who, were recovered in Nigeria, Africa, and subsequently returned to the BBC. The episodes were discovered by Phillip Morris, director of Television International Enterprises Archive, by the tracking records of overseas shipments made by the BBC containing tapes for transmission. BBC Worldwide has re-mastered these episodes to restore them to the fantastic quality that audiences expect from Doctor Who. The stories recovered are The Enemy of the World (1967) and The Web of Fear (1968) - both starring Patrick Troughton as The Second Doctor. Also recovered is the 1968 six-part story, The Web of Fear. Episodes 2-6 were feared lost forever but now episodes 2, 4, 5, and 6 have been recovered. Unfortunately, episode three is still currently missing but a restoration team has reconstructed this part of the story using a selection of the 37 images that were available from the episode along with the original audio which has been restored. All episodes are available to download exclusively from iTunes from today (links at the bottom of this article). The Enemy of the World will also be available to preorder exclusively on DVD from BBC Shop from 11th October for release on 22nd November. The Web of Fear will be available on DVD on 24th February 2013. DWO have been given the preview for the Limited Edition DVD cover which you can see in the right-hand image column. The press event itself kicked off with a statement by Philip Morris, read out by TIEA archive coordinator, Roy Robinson, in which Morris thanked the BBC and Doctor Who fans for their support. This was then followed by a short video presentation by Philip Morris, explaining the story behind the recent finds, and conveying his own childhood memories of Doctor Who. The room then went dark as Episode One of The Enemy Of The World was shown. 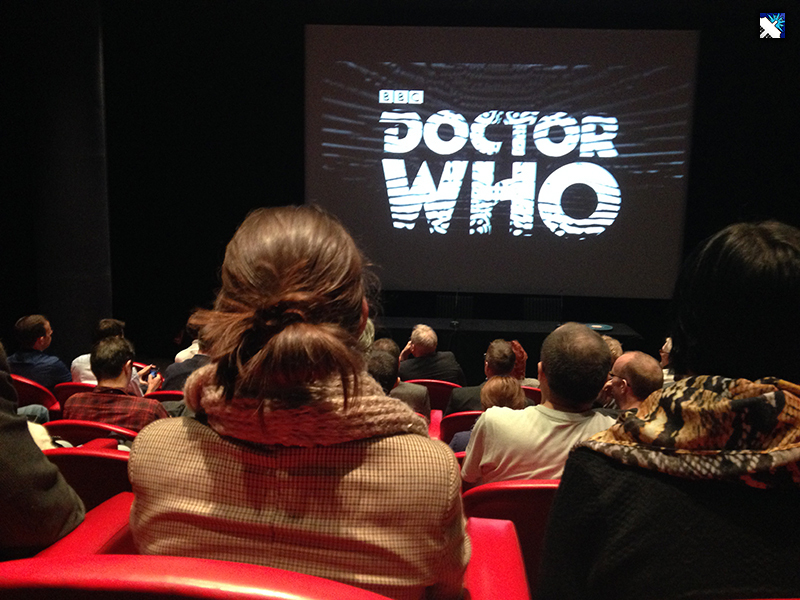 It was a surreal experience - actually sitting down to watch brand new, yet old, Doctor Who - unseen for over 45 years! We were quite blown away by the opening scenes on the beach, with helicopters, hovercraft and long johns - and all in the first five minutes! Every moment was filled with joy as the episode unfolded and we got to see Patrick Troughton's dual performance as The Doctor and Salamander. After the episode had aired, Mark Gatiss introduced Episode Two of The Web Of Fear, citing it perfectly as "the quintessential Doctor Who story that's also the most British thing you could imagine". On a personal note, this was the story that we were *really* excited to see. To actually see the Yeti / Great Intelligence in action in the London Underground was really special. Interestingly, The Doctor only featured in the recap at the beginning of the episode, and doesn't show up at all in Episode Two - one of the first true examples of a Doctor-lite episode! Total TV Guide: (To Frazer and Deborah) Do you remember doing the scenes? Deborah: Watching it just now, I knew the next lines! Frazer: Yeh, but you didn't know them at the time on set, did you?! Daily Telegraph: (To Frazer and Deborah) What made Patrick Troughton's performance so special? Deborah: He had a wonderful sense of humour and a twinkle in the eye, but he was also a very, very good actor. We all got on so well and we were like a family. We had a chemistry, and I think it showed today. Doctor Who Online: (To Frazer and Deborah) Did you keep any mementos from either of the two stories? Deborah: I had one of the ornamental Yeti's but it broke in the middle, so Andrew Beech was kind enough to fix it for me. Frazer: eBay! - I also had one of the Yeti's - and space glasses, but my mother told me to throw it all away, so I did. BBC Worldwide have provided DWO with some trailers and clips from The Enemy Of The World and The Web Of Fear, which you can watch below. 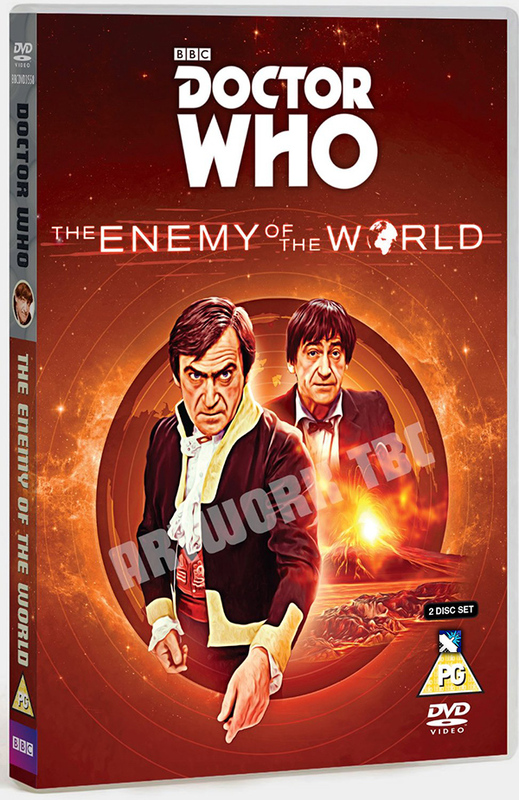 + Preorder The Enemy Of The World DVD on BBC Shop for just £13.99! 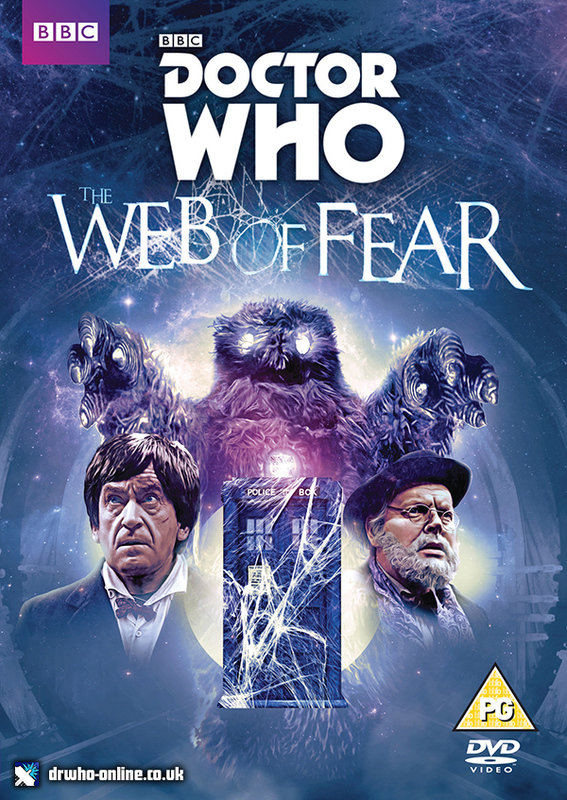 + Preorder The Web Of Fear DVD on BBC Shop for just £13.99! Researches for a forthcoming biography of a ‘60s Doctor Who writer have turned up an intriguing curio: a draft script of William Hartnell’s final episode which doesn’t end with the Doctor regenerating. William Hartnell’s Doctor bowed out in October 1966 with the four-part adventure “The Tenth Planet”, a story which not only introduced the concept that the Doctor could change his appearance, but also saw the first appearance of the Cybermen. Now author Michael Seely, who’s working on a biography of the story’s co-author, Dr Kit Pedler, has unearthed draft scripts of all four episodes which predate the decision to write out William Hartnell. “I found these scripts and two more from ‘The Moonbase’ (known then as ‘The Return Of The Cybermen’) among a very large collection of Kit’s papers which one of his children had kept in their attic,” explains Seely. “As I looked through it, I realised it was the first draft [script editor and co-writer] Gerry Davis prepared when Kit fell ill in June 1966." The fact that this script was written in June 1966 and rehearsals for the story began on 14 September only underlines that the actor’s departure was decided upon rather late in the day (Hartnell’s wife’s diary records that he told her on 16 July 1966). 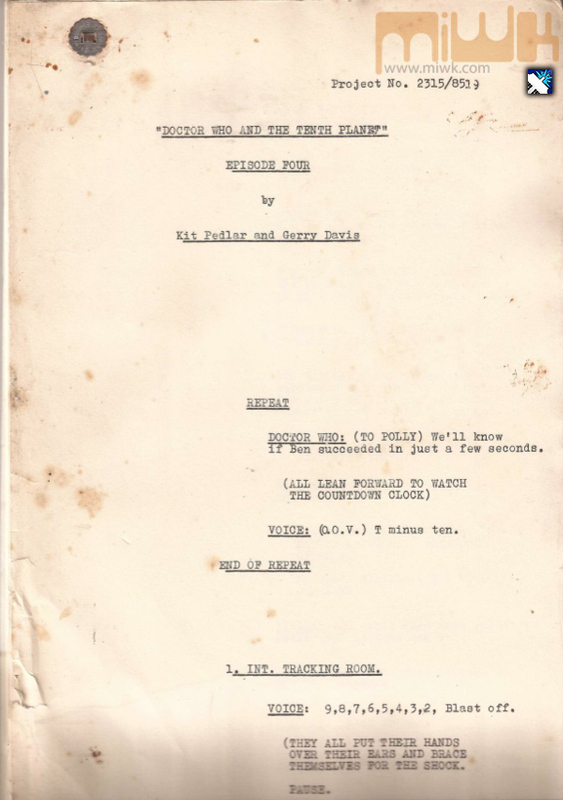 The cache of Pedler’s papers also includes five original storylines for Doomwatch, the 1970-1972 eco-thriller TV series he co-created with Gerry Davis - including several that were never made - as well as proposals for further TV shows, a couple of never-recorded radio plays, and various unfinished books and short stories. + The Quest For Pedler by Michael Seely is due for release in Early 2014. Visit www.miwk.com for more details. It is with deepest regret that DWO announces the passing of Classic Series Doctor Who Actor, Christopher Burgess. Christopher was perhaps best known to Doctor Who fans for appearing in the Classic Series, 2nd Doctor adventure; The Enemy Of The World as Swann, and in the 3rd Doctor adventures; Terror Of The Autons as Professor George Philips, and Planet Of The Spiders as Barnes. Christopher's other career highlights include; Z Cars, The Medusa Touch and Jossy's Giants. It is with deepest regret that DWO announces the passing of Classic Series Doctor Who Actor, Michael Goldie. Michael was perhaps best known to Doctor Who fans for appearing in the Classic Series, 1st Doctor adventures; The Dalek Invasion Of Earth as Jack Craddock, and The Chase as Mire Beast, and the 2nd Doctor adventure; The Wheel In Space as Elton Laleham. Michael's other career highlights include; Robin Hood: Prince Of Thieves, Lady Jane and Coronation Street. It is with deepest regret that DWO announces the passing of Classic Series Doctor Who Actor, Kristopher Kum. Kristopher was perhaps best known to Doctor Who fans for appearing in the Classic Series, 3rd Doctor adventure; The Mind Of Evil as Fu Peng. Kristopher's other career highlights include; Revenge Of The Pink Panther, Gwendoline and The Bridges Of Fu Manchu. DWO would like to extend our sympathies to Kristopher's family and friends. Terry Nation To Get Blue Plaque? Llandaff Society is hoping to join celebrations for the 50th Anniversary of Doctor Who by unveiling a plaque for creator of The Daleks, Terry Nation, on the home he grew up in, in Cardiff. Now the heritage loving Llandaff Society is hoping to celebrate the life of their creator, Terry Nation, with a blue plaque on the home he grew up in Cardiff. “We are trying to get a blue plaque put up at the time of the 50th anniversary on the house where Terry Nation came from. At the moment we are seeking permission from the owner of the house and, in addition, we want the BBC to take an interest in this, and possibly get one of the main characters from the Doctor Who series to do the unveiling. If we could get Matt Smith we would be delighted. But we don’t know whether he will be around. If you look at the duration of the Doctor Who series, over a 50 year period, and the fact that the Daleks appeared in the second series and have been there ever since as the arch enemy of the doctor, there must be something about them that has made them iconic to young people. He is waiting for the BBC’s head of drama publicity to get in touch with him. Terry lived in 113 Fairwater Grove West, which is tenanted currently. He was a schoolboy at Canton High School and lived at Fairwater Grove West for the first 20 years of his life before going off to make his fortune in London, and subsequently in Hollywood as a scriptwriter. Terry also came up with cult sci-fi shows Blake’s 7 and Survivors, and worked on The Avengers, The Baron, The Persuaders, The Champions, Department S, and The Saint. It is hoped CADW will provide half the funding for the memorial, which would be made either from ceramic or aluminium. There is no official blue plaque scheme in Wales but there is a civic initiative scheme run by the Welsh Government agency. As a Doctor Who website, posting a news item relating to missing Doctor Who episodes is a particularly conflictive task. On one hand you want to hold off on posting news due to the possible reaction you might get from smaller circles of fandom, whereas on the other hand, it's surely our duty to report it - after all, news is news, right? Some of our readers may remember a news item we posted a few years ago about the possibility that The Web Of Fear may have been found - note the words 'possibility' and 'may'. While we also added that our source was reliable in the past and had no reason to disbelieve them, this particular news item turned out to hit a dead end and despite the majority of our readers who were grateful for the reporting of the story, we did face a backlash from some smaller circles of fandom on online forums. A couple of days ago, Rich Johnston of Bleeding Cool News, posted a news item relating to some of the rumours that have been doing the rounds for the past few months - rumours that, up until now, we have avoided reporting on. The rumour is that a considerable number of lost Doctor Who episodes have been found by "an eccentric engineer who worked for broadcasters across Africa with a taste for science fiction and a habit of taking things for safe keeping". DWO can confirm that we have been approached with news from several high-profile sources, some of which confirm these rumours and some that conflict with them and the actual figure of the number of episodes rumoured to have been found. Whilst it would be easy to blurt out everything we have been told, we retain the caution from previous rumours and hoaxes, and will simply hold out for official confirmation - when and if it comes. What we will say is that *should* the rumours be true, despite the initial excitement at the possibility, it would be wise to sit back and let the BBC do what they need to do to secure these episodes *if* in fact they have been found. We of course encourage debate and discussion which you can take part in on the dedicated DWO Forums Missing Episodes thread using the 'Discuss' button below. It is with deepest regret that DWO announces the passing of Classic Series Doctor Who Actor, Aubrey Woods. Aubrey was perhaps best known to Doctor Who fans for appearing in the Classic Series, 3rd Doctor adventure; Day Of The Daleks as The Controller. Aubrey's other career highlights include; Willy Wonka And The Chocolate Factory, The Old Curiosity Shop and Blakes 7. DWO would like to extend our sympathies to Aubrey's family and friends.